Mr Bumpy Cat: Just Purrrrrrrrrrfect! to wake a sleeping human. One of my favourite ways to wake Mum up in the morning is to put my cold nose as far into her ear as it will go and purr, loudly. Mum says it is like someone starting a chainsaw in her skull. It's very effective. Imagine how much more effective it would be if instead of sounding like a chainsaw, I sounded like a jet engine! Smokey is an incredibly talented cat. 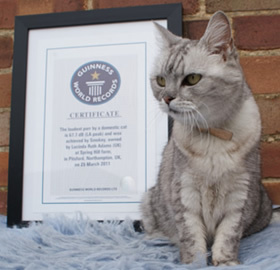 So talented, in fact that she has a Guinness World Record! Her talent is purring. Any cat can purr, of course, but Smokey is the loudest ever measured. She has a purr of 67.7 decibels. OK, maybe that's not quite a jet engine, but it's pretty loud. If you wonder about it - here a link to a chart of what sounds have what decibel readings. If Smokey were purring in the room, two humans wouldn't be able to have a normal conversation. They would have to yell over top of her. Of course, humans rarely have anything important to say, so this wouldn't really matter. If you take a look at her website, you'll find she's so talented, she's also written a book. I understand a human may have helped her a little with that, but you know humans, probably more of a hindrance than a help. Humans do like to feel helpful though, so you really have to let them try. So, check out my new friend's site. I couldn't find a recording of her purring on the site anywhere - but maybe that's for health and safety reasons. Wouldn't want to deafen anyone listening to their computers, I suppose.